Branding. What a big, sprawling term. In a sense, what aspect of our business isn’t impacted by branding? Luckily, I’ve got a really smart branding mind as a guest to help us out with that. Jeremy Miller is the founder of Sticky Branding and the author of the book by the same name. 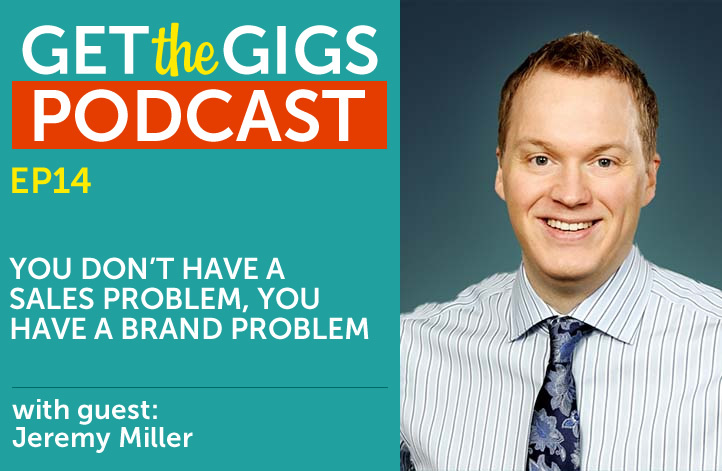 Jeremy drops by for a packed conversation about what you can do to make your brand a great one. What lead to Jeremy being so interested in branding? What are some of the red flags that you might have a branding problem? The book is a game-changer…I hear that so often. What does a speaker have to deal with from a branding standpoint versus other companies? Who are some of the personal brands that Jeremy looks up to? Man, Scott Stratten’s come up so often on this show! Your brand is your universal truth. Jeremy’s website and marketing budget is how much??? What happens when the brand doesn’t reflect your personality? Make sure you check out Jeremy’s site. With all that said, I have a question. What is your brand saying about you? If someone were to look at your website, how would they say it describes you? This is something I want to help you out with (for free!). All you have to do is shoot me a link to your website at derek@getthegigs.com or you can leave a comment below. I will respond with my unbiased thoughts in hopes of helping you get some clarity about your brand.